Naish, D. 2010. Tetrapod Zoology: Book One. CFZ Press: United Kingdom. This review is probably a little redundant. 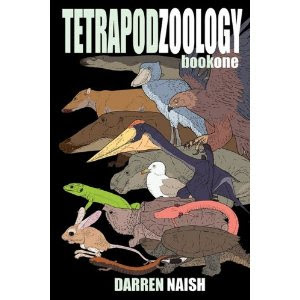 I suspect that most of my regular readers are probably already familiar with Tetrapod Zoology, Darren Naish's leading blog on all things vertebrates-that-ain't-fish-y. Nevertheless. The original version of Tet Zoo debuted in January 2006, almost five years ago. Tetrapod Zoology: Book One is a collection of most of the posts which appeared from January to July of that year. For the most part, the text remains the same as it first appeared; the main change is that some of the topics that appeared as multiple posts have beeen fused into single chapters. The included chapters cover topics from cave-dwelling salamanders to corpse-hunting turtles, from contentious monkeys to elusive warblers. As always, Darren has the rare knack of combining breezy readibility with an extraordinary wealth of detail. And as well as chapters on dramatic topics such as giant pterosaurs and British big cat sightings, the book contains examples of Darren's even more admirable ability to highlight the extraordinary sides of seemingly unremarkable animals such as rabbits, gulls and owls. Such issues are not unique to blogs, of course—had this been a collection of magazine essays or newspaper columns, there would be cause for the same complaints. Still, I feel that the layout of this book should have embraced its history more, rather than simply presenting the sections as if they were written for the book. It would have been nice to have been given the original release date for each of the chapters (Darren does make it clear in the introduction that they were written in 2006, but it would have been good to have individual dates, ideally at the head or foot of each chapter). If nothing else, doing so would allow the inclusion of Darren's legendarily detailed April 1 posts*. Also, while Darren does include an update section in the book's introduction mentioning some of the significant events that have happened since relevant to the original chapters, it may have been better to present each chapter's updated separately as an addendum to the chapter itself. And I'm surprised that Darren failed to mention Roosmalen et al. (2007) in which the new peccary species discussed in the final chapter was named Pecari maximus (the validity of the species apparently remains contentious). *I'm also personally disappointed by the absence of one of my favourite Tet Zoo posts from the period included—indeed, one of my favourites of all time—the story of Walter Rothschild and his all-consuming cassowary obsession. None of these complaints, of course, are particularly serious. Most of them disappear if the book is read as its contents were originally intended: not as a unit, but as a series of fascinating essays to be indulged in, one chapter or two at a time, when looking for a half-hour or so's entertainment. And there would be few people indeed who would fail to come away from it without an increased sense of wonder about the animals it describes. Of course, you may be wondering why you should be paying for something that is available for free online. To which I can simply point out that, as well as the moral satisfaction of doing your part to help keep Darren and his family in stockings and fans, the success of this book can only encourage him to produce more. Hopefully, Tetrapod Zoology: Book Two will not be long in coming. Roosmalen, M. G. M. van, L. Frenz, P. van Hooft, H. H. de Iongh & H. Leirs. 2007. A new species of living peccary (Mammalia: Tayassuidae) from the Brazilian Amazon. Bonner Zoologische Beiträge 55 (2): 105-112. "Of course, you may be wondering why you should be paying for something that is available for free online." IIRC, Darren has stated that one of the main reasons for publishing his blog articles in book form was the concern that one day they might not be available online anymore. Very true. Any online resource will only exist as long as its owners are willing to maintain it and/or allow it storage space. Thanks loads, the criticisms and suggestions are really appreciated and I'll take them into account should future volumes be produced. Most of the slipshod aspects of the volume reflect the fact that I got to the stage where I wanted it out asap - after it, it sat on the backburner for about two years while other projects took priority. Regarding the contents, my plan was to publish the chapters in chronological order... but I'm unsatisfied with this, and am going for a phylogenetic plan in future. Anyway, thanks for a great review.